Rachel went to a birthday party recently for a set of twins she babysits. Their grandmother wanted to purchase some bantam chicks from Rachel (which of course, she has) so she carried two chicks in a box with her to the party. I was confused, as usual. Had she brought the bantam chicks back home? I looked inside the box and discovered her new babies were baby rabbits, not chicks. Rachel found them abandoned in the yard where the party took place.They don’t even have their eyes open yet, but they make noise just like a squeaky toy, which was driving the dachshunds crazy. 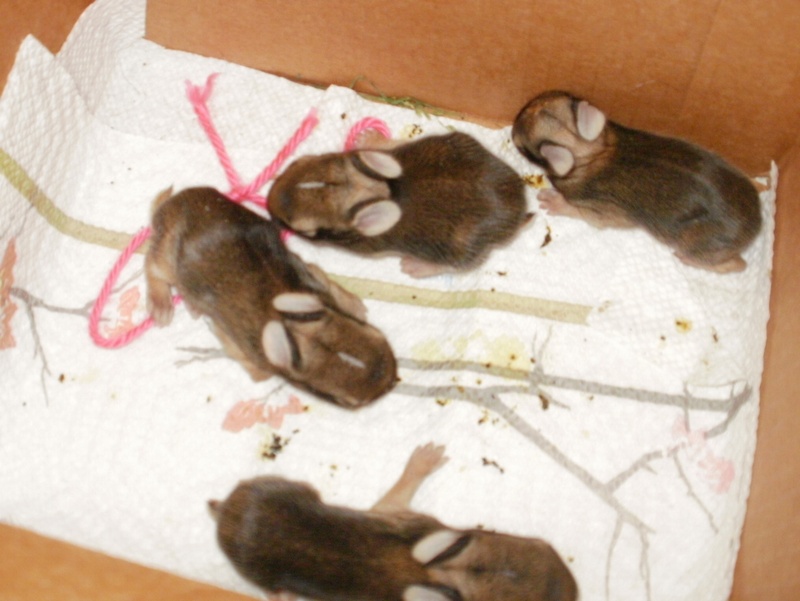 The momma rabbit was nowhere to be found, and the four babies were in danger of starving. Something Rachel could not allow. Becoming rabbit rescuer Rachel, she loaded the babies into the box then stopped to purchase formula and syringes on the way home so she could feed the rabbits every two hours. This morning a friend brought her boys over to Miller Farm to see the chickens and quail. Little did my friend know that today we would also have baby rabbits. Every day is an adventure here on Miller Farm. These were probably only about 2 inches long and their eyes and ears were still closed. After the first night, their ears must have opened because the second night they did not sleep well at all. Rachel called around and found a wild life refuge in Houston that would take them. There happened to be a van coming to Texas A&M that morning that could transport them back. Rachel took them to the small animal clinic at A&M and dropped them off. I need to call and check on them. I know Rachel slept better without the furry room mates. Information helpful. I have wondered. Now I don’t have to wonder anymore. Thank you. I just love that Rachel. If y’ll get tired of her, send her to us. We (BB aka baby brother who lives with me) have new batches of wild rabbits often, especially in the Spring, born under our front and back porch. When we first notice them, they are probably only about the size of my hand. I don’t have a small hand, that would be odd on a person as tall as I am. I have often wondered when they are first allowed out of the nest on their own. I still wonder that.